Less Stress & More Fun! Weekend Student Adventures is designed for the budget traveler and student who want something more from their visits to amazing European destinations. We've crafted each tour to maximize your local cultural interaction, each euro you spend, and every minute you have in some of our favorite cities on the planet. We've got packages designed to fit every budget, travel time and interest. Read on for more! WSA Trips are all 'Fly-In' meaning meet us in the city and we'll take it from there! We're famous for our 3-day, 2-night experiences in Amsterdam, Barcelona, Budapest, Edinburgh, Florence, Reykjavic, Krakow, Paris, Prague and Rome. Read each of the trip details page for more info, but regardless of the destination you choose, get ready for an unforgettable adventure! You asked, and we listened! In all the cities above, you can opt out of the accommodations provided so you can find your own apartment or accommodation independently--with friends or on your own. Book your bed, book the WSA trip, and just meet up with the group for great days experiencing these historic cities. These trips are perfect if you've got a bit more time to spend traveling with us. Our packages take you through Ireland (Dublin & Galway), Central Europe (Prague, Krakow and Budapest), Northern Europe (Amsterdam, Brussels, Bruges & Paris) and Italy (Venice, Cinque Terre, Pisa, Florence & Rome). These are definitely the best value, with tons included and all inter-city transportation throughout the week. These are custom-tailored DIY Packages for the more independent traveler. Think of them like a guidebook that does the work for you, including sightseeing and accommodation reservations. 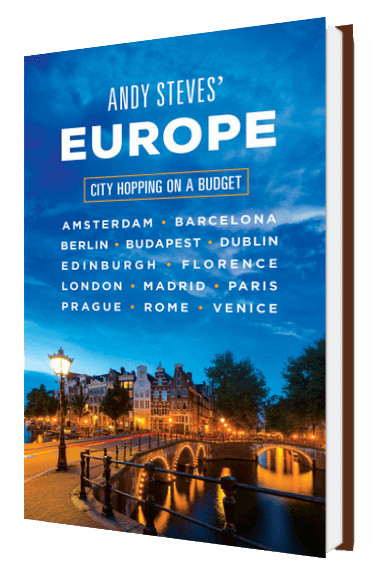 These tips are pulled from Andy Steves' book, Andy Steves' Europe: City-Hopping on a Budget. Learn more about Detours here. You can't forget our most popular celebration weekends either! We've got St. Paddy's Day in Dublin and Easter in Rome lined up. We make reservations LONNNGGG in advance and pass the savings onto you so you know you can show up and have all the fun, and none of the headache over these busy times. Check them out! With 200+ 5-star reviews on Tripadvisor, and a 4.7/5 star review on Facebook, we're proud of the incredible experiences we offer in all of our destinations. We're constantly tweaking and improving these weekend and week-long tour packages, but given the feedback we've received, we know we're headed the right direction! Students always tell us they wish they knew about us sooner, and traveled with us more. No one can truly show off a destination as well as someone who lives there! WSA's Locals are professional guides armed with intimate knowledge about their home towns hand-selected by Andy Steves. WSA's guides get you off the beaten track to reveal the insider's take on these world-class destinations. Other companies pair you with amateurs who don't know much more about the destination they're taking you to than you do. Regularly given top ratings, WSA guides bring these cities to life, rather than just taking attendance. We know guides can either make or break your trip and we pick the best ones! Our hostels are all hand selected, reserved ahead of time at the best rate, to ensure they have a fun atmosphere, unbeatable location, and top reviews. Hostels are a great way to meet new people from all over the world while saving money. WSA includes all of it--with group and in your free time. Our competition doesn't include any. In cities like London and Paris, local transportation can easily climb way past 30 euros throughout the course of a weekend just by riding the metro or bus. WSA knows you want to experience the key sights in each city, so we include them! And we skip the line into each site along the way, saving you hours. With the time saved, we can check out cool neighborhoods and unique markets around town. It's a win-win! Our competition doesn't include skipping the 2-hour lines in their packages. They will often walk you up to the entrance of the Sagrada Familia in Barcelona or the Eiffel Tower in Paris and leave you there to handle the rest. Food is one of the best ways to experience new cultures and our local guides know all the best spots. We're excited to share unique cultural dining experiences for you in every single WSA destination. Pizza, gelato and wine in Rome? Done. Hearty goulash and world-famous beer in Prague? Absolutely. And our local leaders know the perfect spots. Other tour companies run groups of up to 150 people. With group sizes that large, their "guides" are reduced to crowd-herders. FLEXIBILITY: Our trips jive with your schedule. Late class on Thursday? No problem, book a later flight. Have extra time? Extend your stay in the city. OPTIONS: Coordinate a weekend adventure with friends studying in other cities. Book the same weekend and you're guaranteed a great time together. The trip itself is always busy--we pack in a ton of sightseeing, great culinary experiences, free time for you to explore, and of course nights out to experience the living culture each city is uniquely famous for. We recommend arriving Thursday evening, and departing as late as possible on Sunday to give you as much time as possible in-destination. Our guides fill Sundays with fun optional activities such as trips to local farmers markets and our favorite spots around the city. Check out our FAQ page for all the answers! And get in touch via email here.